Topics: Financial / Insurance Recruiting, Management Recruiting, Interviewing Tips, and Resume Tips. Age: The domain is 17 years and 0 months old. 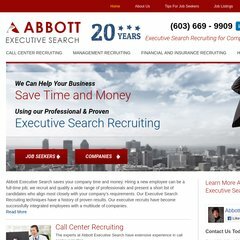 abbottsearch.com Health Care Recruiting Nurse Recruiting Services Abbott Executive ..
Rackspace Hosting Texas is the location of the Apache/2 server. Its IP Number is 50.56.8.237. It has 2 DNS records, ns.rackspace.com, and ns2.rackspace.com. PING (50.56.8.237) 56(84) bytes of data.